Dubai Creek or Khor Dubai is a saltwater creek located in Dubai. It ends at Ras Al Khor Wildlife Sanctuary. Some sources say that the creek extended as far inland as Al Ain, and that the Ancient Greeks called it River Zara. 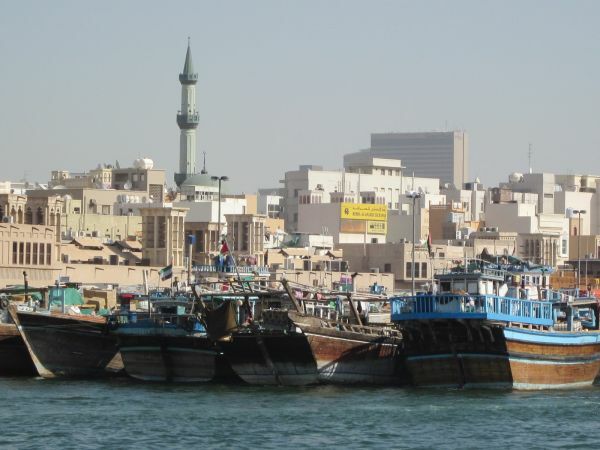 The creek divided the city into two main sections – Deira and Bur Dubai. The importance of the creek as a site of commercial activity was a justification to introduce improvements to allow larger vessels to transit, as well as to facilitate loading and unloading activities. This led, in 1955, to a plan to develop the creek, which involved dredging shallow areas, building of breakwaters, and developing its beach to become a quay suitable for loading and unloading of cargo. The creek's initial inlet into mainland Dubai is along the Deira Corniche and Al Ras areas of eastern Dubai and along the Al Shindagha area of western Dubai. It then progresses south-eastward through the mainland, passing through Port Saeed and Dubai Creek Park. The creek's natural ending is at the Ras Al Khor Wildlife Sanctuary, 14 kilometres (8.7 mi) from its origin at the Persian Gulf.